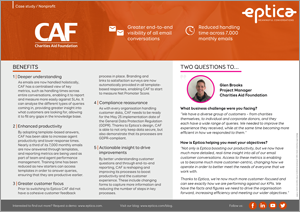 Charities Aid Foundation (CAF) | Eptica - Multi Channel Customer Interaction Software. Email Management. Web Self-service. Live Chat and Agent Knowledgebase. Established over 90 years ago, CAF works with a wide range of organisations and individuals, meaning that its 80 strong customer service team has to respond to emails across a wide range of topics. These can concern corporate Give As You Earn schemes, individuals looking to donate through CAF accounts or charities themselves looking to boost their fundraising.